31-12-2019 Make the most of Europe’s cultural events and enjoy a up to 30% off your stay at Millennium Hotels and Resorts. Plan a visit to the cinema or the Louvre in Paris, British Summer Time Festival in Hyde Park, the new Tate Liverpool or any of the other summits, conferences or cultural events in Europe to participate in this exclusive offer. Offer also includes: - Complimentary breakfast - Late check-out - Spa Access & Gym Access. Terms and Conditions: - 20% Discount off the Flexible and 10% Extra discount for all Loyalty Members - Late Checkout is subject to availability and at a maximum checkout time of 2pm (local time) - This promotion is not valid in conjunction with any other offer and does not apply to group rates - Tickets accepted: Attendance tickets to performing events, museums (Guide ticket when is free entrance), conferences, summits, live music, dance, etc. - Offer valid for bookings and stays until 31st December 2019. 22-04-2019 Make your order Millennium & Copthorne Hotels with this 30% discount. Book your stay with Millennium Hotels and Resorts in Singapore, Kuala Lumpur, Penang, Jakarta, Phuket or Manila to enjoy up to 30% off The Flexible Rate, Complimentary Breakfast*, Wi-Fi and other exclusive benefits. Terms and Conditions: - Booking period is from 18th March till 1st April 2019 - Stay period is from 19th March 2019 to 30 June 2019. Get 35% off middle east hotel room bookings. Get up to 10% off your room bookings when you sign up for emails. Get up to 25% off Stay at Millennium Hotels and Resorts + Unlock 10% and Extra 5% when you sign up for emails + Free Wifi when you book Direct. Lowest Rate London! Millennium & Copthorne Hotels Celebrate Your holidays with Millennium Hotels and Resorts Asia. Book the great escape rate and get up to 30% off the flexible rate, complimentary Wi-Fi and other exclusive benefits. Millennium Book your stay at M Social Singapore and get up to 30% off in room stay. Breakfast included. Terms and Conditions: - Booking period is from 13 February 2019 to 26 February 2019 - Period of stay is until 31 March 2019. New year, New you! Book your stay at Millennium Hotels & Resorts, Asia and get up to 30% off. Terms and Conditions: - The link will be activated on 2nd of January. - Booking period is from 2nd January till 14th January 2019. - Period of stay is 2nd January till 30th April 2019. Celebrate Christmas in Asia and Say Hello to 2019 in Style! Book our Celebrate Merriment's rate and get up to 15% off rooms and other exclusive benefits! at Millennium Hotels & Resorts Asia. Offer includes: - Complimentary breakfast - 20%* off Dining (Exclusive For My Millennium Members) - Free Wi-Fi Terms and Conditions: - Offer valid until 31 December 2018 - Stay period is until 31 January 2019. Millennium & Copthorne Hotels 20% off The Flexible Rate and Complimentary Breakfast Millennium Hotels & Resorts, Asia. Millennium Hotels Up to 30% Off Selected Hotel Bookings. Millennium Hotels 10% Off Auckland Club Room Bookings. Millennium Hotels $50 Macys Gift Card on Selected Buffalo Hotel Bookings. Millennium Hotels Get Flexible Rate on Selected Europe Hotel Bookings. Millennium & Copthorne Hotels Take advantage of this offer and get discount price. Find your favorite in the new arrivals. Millennium & Copthorne Hotels No one beat Millennium & Copthorne Hotels on price. Fast delivery. Visit Millennium & Copthorne Hotels to get the latest likes, loves, and got-to-haves. Purchase now while this offer lasts. Offer cannot be applied to previous purchases or used in combination with any other offer. Prices subject to change without notice. Instant savings applied during checkout. Millennium & Copthorne Hotels Grab this bargain offer before it expires. What are you waiting for! 100% Risk Free. 100% Easy. Free Returns. Millennium & Copthorne Hotels Last call - stock up and save on tons of items. Everything from hotels, Tours+ to Meetings & Events. Cancellation or refund requests are subject to the refund policy Claim the offer before it expires. Instant savings applied during checkout. Millennium & Copthorne Hotels Grab this bargain offer before it expires. Cannot be combined with any savings pass/coupon, extra discount or credit offer. Extra savings % applied to reduced prices. Keep an eye out for the newest offers. Millennium & Copthorne Hotels Watch here for the latest and greatest offers and savings! Offer cannot be applied to previous purchases or used in combination with any other offer. Prices subject to change without notice. Millennium & Copthorne Hotels The offer is valid for a limited period only. No code, discount automatically taken at checkout. 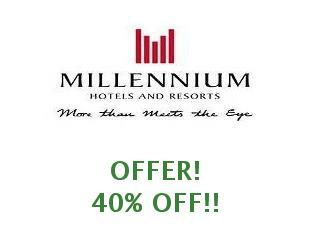 Millennium & Copthorne Hotels 40% off Select Items. Millennium Hotels Free Breakfast with Selected New Zealand Hotel Bookings. Millennium Hotels 25% Off Selected US Suite Accommodation Bookings. Millennium Hotels Free $25 Food and Beverage Credit Site Wide. Millennium Hotels 10% Off $125+. Millennium Hotels and Resorts Up to 20% Off Asia The Best Rate. Millennium & Copthorne Hotels Check out the details of this offer. And lookout for the update later. Millennium & Copthorne Hotels Cancellation or refund requests are subject to the refund policy Check out the details of this offer. And lookout for the update later. Millennium & Copthorne Hotels Classic Faves on FLASH SALE!!! Start saving now. Millennium & Copthorne Hotels Shop for a cause during this sale. Discover roundup of must-own items for this season. Millennium & Copthorne Hotels The offer will be gone in a flash. Millennium & Copthorne Hotels Offer cannot be applied to previous purchases or used in combination with any other offer. Prices subject to change without notice. Purchase now while this offer lasts. Stock up on your favorites & save! Millennium & Copthorne Hotels Offers are subject to change without prior notice. Other terms and conditions apply. Get 20% off Millennium & Copthorne Hotels's best. Millennium & Copthorne Hotels Stock up on your favorites & save! At Millennium Hotels and Resorts we offer luxury hotel stays for business and leisure travelers around the world. Book your next trip. Millennium Hotels and Resorts offers quintessential hotel rooms worldwide with unparalleled quality and service. Enjoy the comfort of the luxury Millennium Hotel Minneapolis while experiencing exclusive services, amenities, and a convenient downtown Minneapolis location. Book Millennium Cincinnati. To use a Millennium Hotels promo code, just fill your cart. The savings will be automatically added at checkout.